Flat top fences lack much in the way of design detail. Adding cap and trim to a flat top panel is a simple way to dress it up and give your fence a custom look. Cap and trim features two horizontal trim pieces. One runs just at the top of the fence pickets, while the cap sits on top of the fence. You can use standard prefab fence panels to create this look quickly and easily at a much lower cost than building board-to-board. Use dimensional lumber to create the cap and trim. Cap and trim can be added to flat top fences for added detail. 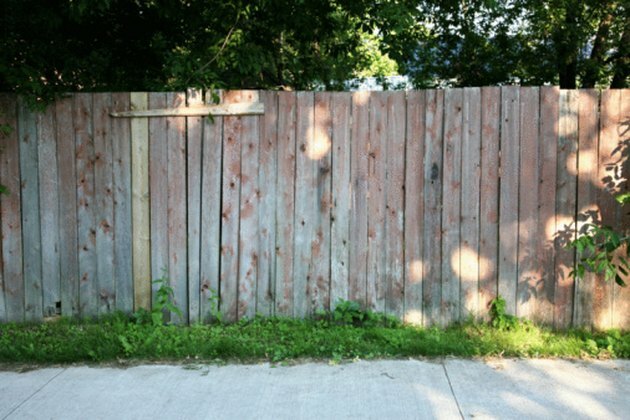 Measure the length of your fence and mark the two outside corners. Use a three-pound hammer to drive in wooden stakes at each corner. Stretch mason's string taut between the stakes to mark the line of the fence. Stretch a tape measure starting from one stake along the string. Wrap a small piece of masking tape around the string every eight feet. Dig a posthole 24 inches deep and 10 to 12 inches across under each piece of tape, and in each stake location. Set a 4-by-4 treated 8-foot long post in each hole. Add half of an 80-pound bag of dry cement mix to each hole. Lay a piece of 1-by-4 along the ground between the first two posts in the line. Stand your first flat top stockade fence panel on top of it. Stand the first post upright and align it, so that the outside face of the post is even with the ends of the horizontal runners on the fence panel. Drive two 3-inch treated deck screws through each horizontal rail into the face of the post, using a drill. Stand the second post upright and align it so that the horizontal runners of the panel end in the center of the post. Attach with two 3-inch screws through each runner. Add water and mix the concrete in the first two holes to the consistency of thick oatmeal. Use a level to adjust the posts front to back and side to side, until the bubble is centered in the indicator. Pack dirt into both holes with a spade and tamp it down by dropping the end of a 4-by-4 post on it. Move the 1-by-4 to the space between the second and third posts. Add the next panel butted up to the first, on top of the 1-by-4. Align the third post, so that the runners end in the middle of the post. Attach with two screws through each runner. Mix concrete and tamp dirt as before. Add panels in the same way to the end of the fence, aligning the last post so that the runners end flush with the outside of the post. Mix concrete and tamp dirt into the hole. Screw a piece of 1-by-2, eight feet long, in the same material as the pickets of the fence panel, horizontally with its top edge even with the top of the pickets with one 1-5/8 inch screw every 12 inches. Cut one to fit at the end of the fence. Align a 2-by-4 along the top of the fence, with the front edge hanging off 3/4 inch. Attach using 3-inch treated deck screws into each post and into the top of the pickets every 18 inches.